Don’t Forget to Pack Your FasTrak® Transponder – The 73 Toll Road is a popular route for drivers traveling between Los Angeles and San Diego and the 241 Toll Road is a popular route to get to and from the Inland Empire, mountains and deserts to Orange County’s beaches. Be sure you’ve packed your FasTrak transponder before hitting the road. 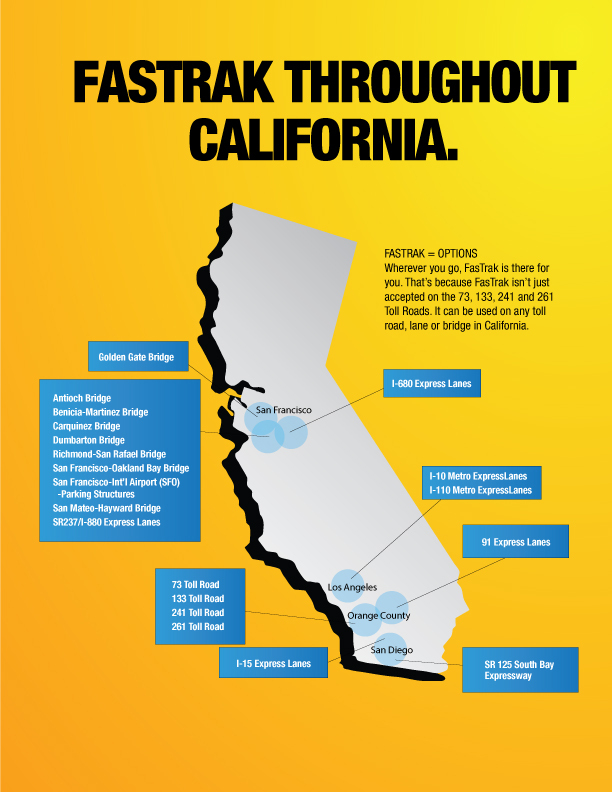 Because not only can you use FasTrak to pay tolls when driving The Toll Roads in Orange County but it also works on all of California’s tolled bridges, lanes and roads. Paying Tolls Without an Account? There’s An App for That. – The Toll Roads recently released a new and improved mobile app allowing you to pay tolls on the 73, 133, 241 and 261 Toll Roads in the palm of your hand if you don’t have an account. 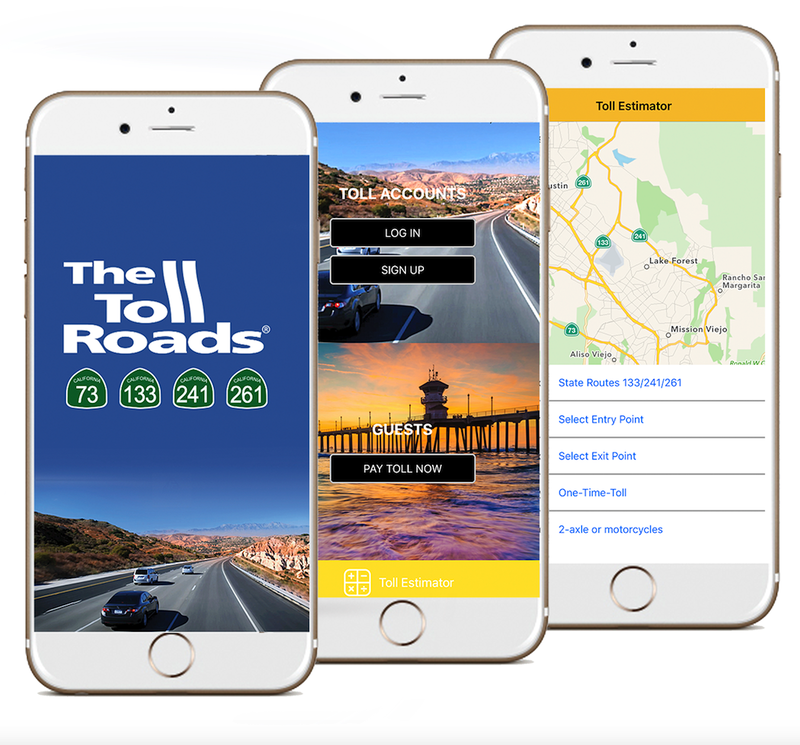 Download the latest version of The Toll Roads’ app by searching “the toll roads” in the Google Play and Apple App Stores and enjoy a stress-free drive in Orange County. You can also compare account types and sign up with the updated app. Paying Tolls With a Rental Car is Now Easier than Ever – The Toll Roads have partnered with most major rental car companies to simplify toll payments by allowing tolls to be charged directly to your credit card through rental car agreements. The new rental car toll payment program, eligible only on State Routes 73, 133, 241 and 261 in Southern California, eliminates the chance of a rental car customer receiving a Notice of Toll Evasion after they return their rental vehicle. Visit our rental car page to learn more about options for rental car drivers, including steps to take if you’re already a FasTrak or ExpressAccount® customer. Calculate Your Tolls – Want to know what the cost is for a particular trip? Check out our online toll calculator to easily calculate your toll by selecting the road you will drive; your entry and exit points (choose “unknown” if you are not sure); how you will pay; and type of vehicle. 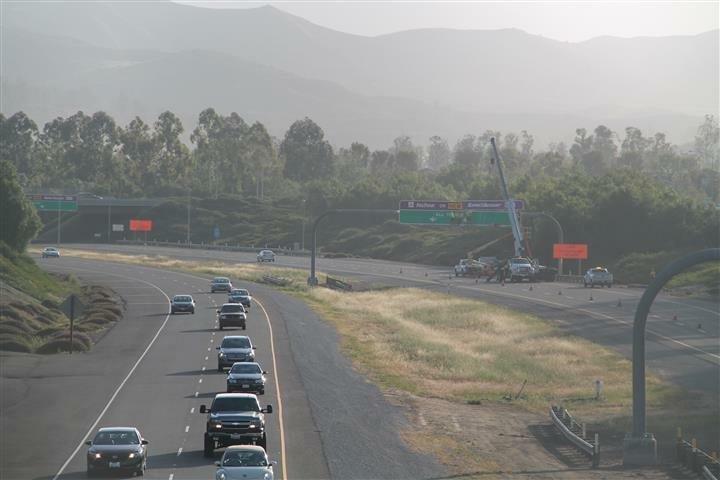 Rates to drive on Orange County’s Toll Roads will increase slightly on Friday, July 1, from one cent to 14 cents, depending on the location and time of travel. The toll calculator webpage also features a downloadable map and rate card. Hosting Family & Friends? –If you’re hosting out-of-town guests or renting or borrowing a vehicle, be sure to temporarily add the vehicle’s license plate number to your FasTrak or ExpressAccount so they can drive The Toll Road without worrying to pay online. Safe travels and enjoy your drive on The Toll Roads. We’ve implemented a program to help drivers transition to all-electronic toll collection, which went into effect on May 14 when cash toll collection was removed from The Toll Roads (State Routes 73, 133, 241 and 261). Through Labor Day, The Toll Roads are waiving penalty fees for first-time violators. First-time violators will receive a notice of toll evasion in the mail with instructions for how to pay the toll online, without having to pay penalty. The toll must be paid online within 30 days of receiving the notice of toll evasion. Violators are drivers who use The Toll Roads without making an attempt to pay their toll(s). 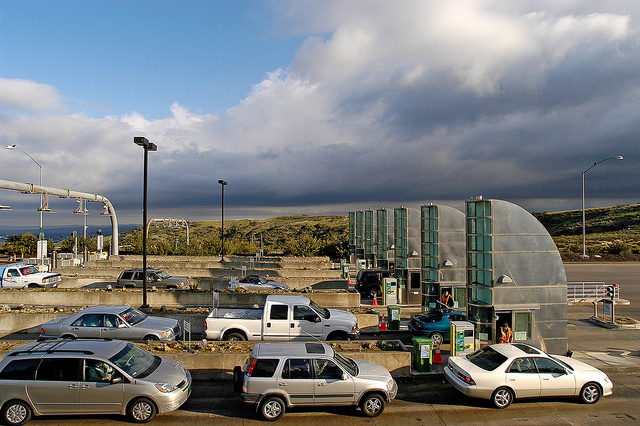 Everyday 250,000 people drive The Toll Roads – and most of them pay their tolls with FasTrak or an ExpressAccount. For infrequent trips, the One-Time-Toll payment option allows drivers to use The Toll Roads without an account and pay the toll online at thetollroads.com or via The Toll Roads’ free app within 48 hours after using the roads to avoid a violation. To help all drivers transition to all-electronic toll collection, The Toll Roads have hired 10 additional customer service representatives to work in the Customer Call Center. With 14 customer service representatives added to the call center before May 14, there will soon be a total of 54 representatives helping customers in four languages. Out on the roads, 236 new signs were posted with the conversion to cash-less tolling — of those, 111 are for One-Time-Toll drivers. Additional signs are being added and will include flashing lights to better alert drivers to changes and how to pay tolls. Beginning Wednesday, May 14 at 12:01 a.m., cash toll collection will cease on The Toll Roads in Orange County, making travel faster and more convenient for the more than 250,000 weekday commuters who choose The Toll Roads. In January, the Transportation Corridor Agencies (TCA), which operates The Toll Roads, introduced four new ways to pay tolls to replace cash toll collection. Along with the hugely-popular FasTrak® payment method, the three new ExpressAccount™ types and the new One-Time-Toll™ option make the drive on The Toll Roads fast and convenient. More than 82 percent of transactions are already paid electronically using a FasTrak or ExpressAccount, while 13 percent are cash transactions. Tomorrow is also the final day of work for toll attendants, who have worked at the Toll Roads toll plazas since the first plaza opened in 1993. All toll personnel (toll attendants, lead toll attendants, managers, assistant managers, etc.) are contract employees of Central Parking System, the largest parking management firm in the country, operating approximately 700 parking locations in Orange and Los Angeles counties alone. CPS will seek to find alternate employment options for these employees in other company positions in Southern California. “We honor the service they’ve provided our customers and they have been part of the success of The Toll Roads,” said Chairman Hill. In just six days cash toll collection will cease on The Toll Roads. Are you ready? 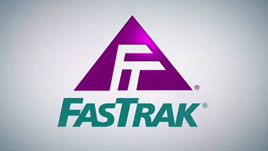 If you have FasTrak® or AN ExpressAccount™ the answer is yes. If you currently pay with cash when you drive State Routes 73, 133, 241 and 261, now is the time to decide how you will pay after 12:01 a.m. on May 14. There are five ways to pay tolls on The Toll Roads: FasTrak, three new ExpressAccount types and the new One-Time-Toll option. Click here for information about the different account options and to learn which one is right for you. TCA is offering new FasTrak and ExpressAccount customers a free week of nonstop driving as soon as they establish an account at thetollroads.com (PROMO CODE: FREETOLL). The offer ends May 11. 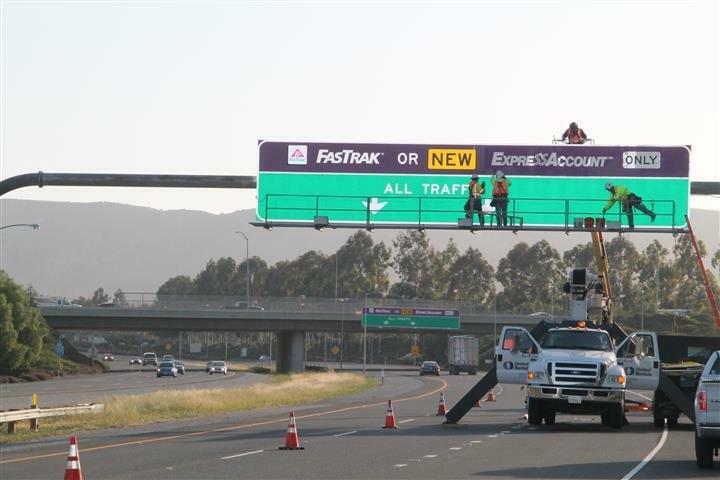 Will you join the 450,336 people who have a FasTrak account or the 69,619 who have an ExpressAccount? In anticipation of The Toll Roads removing cash toll collection on May 14 at 12:01 a.m., 121 new signs are being installed on the 73, 133, 241 and 261 Toll Roads. The new signs are purple, which is the color increasingly being used by tolling agencies across the nation to indicate that a road and/or lanes are tolled electronically. 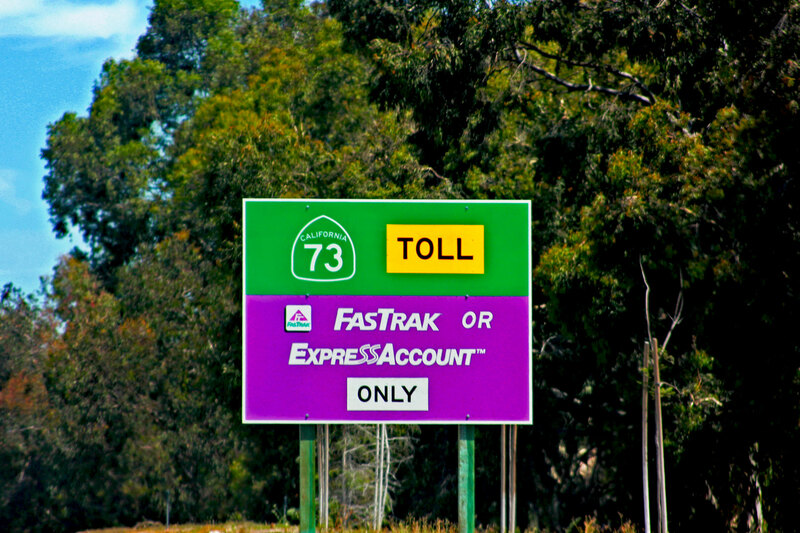 The move to purple signage for all-electronic toll lanes started in 1991 in New Jersey, New York and Pennsylvania. In 2008, the Federal Highway Administration officially supported the use of the color purple for electronic toll collection signs to facilitate smooth vehicle flow and eliminate driver confusion. The new signs on The Toll Roads indicate that all drivers now use the former “FasTrak® Only” lanes. The appropriate tolls will be deducted from the FasTrak or ExpressAccount™ (charge, prepaid or invoice) the vehicle is registered to. 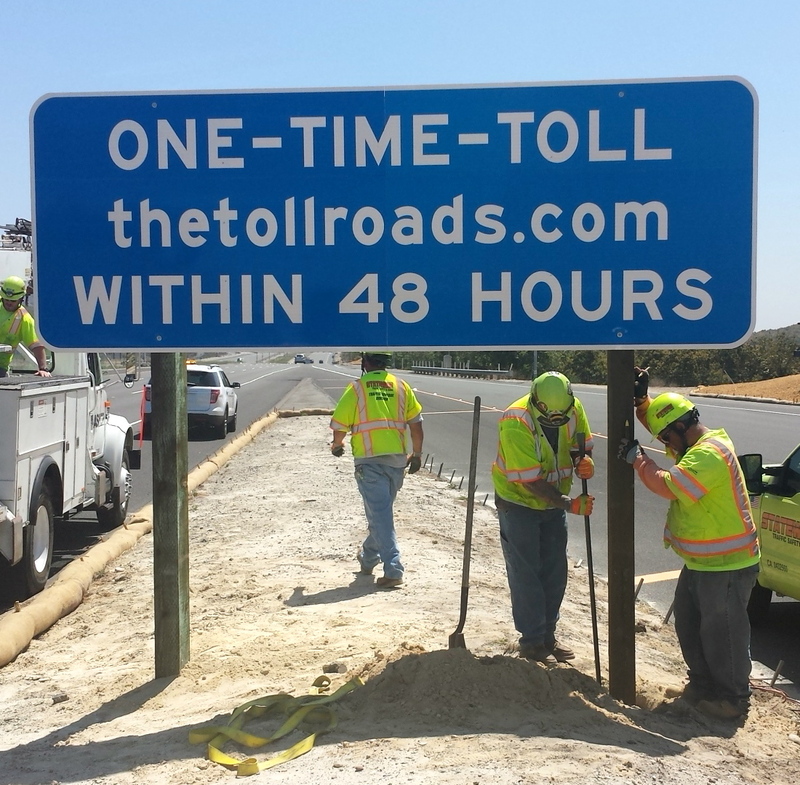 If the driver does not have an account, they can use TheTollRoads.com or our free app to pay a One-Time-Toll™ within 48 hours after the trip. The new One-Time-Toll signs have a blue background indicative of informational road signs and display our website where users can go to pay One-Time-Toll. Of the 121 new signs, 32 are One-Time-Toll signs. Drivers who fail to pay a toll using one of the five, abovementioned options will receive a violation notice. The signs will continue to be installed at night over the next several weeks. In January, The Toll Roads introduced more ways to pay tolls to replace cash toll collection. Along with the hugely-popular FasTrak payment method, the three new ExpressAccount types make the drive on The Toll Roads fast and convenient — and most importantly — nonstop. 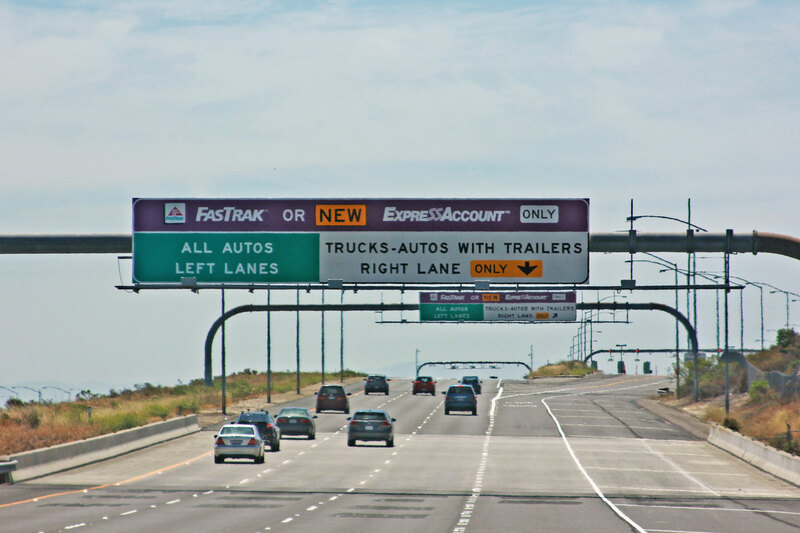 With FasTrak and ExpressAccounts, all tolls are collected electronically while motorists travel at highway speeds. For more information about the different account options and which one is right for you, please visit thetollroads.com. An ExpressAccount can only be used on The Toll Roads (State Routes 73, 133, 241 and 261) and the toll is, on average, 20 percent higher than the toll paid by a FasTrak customer. 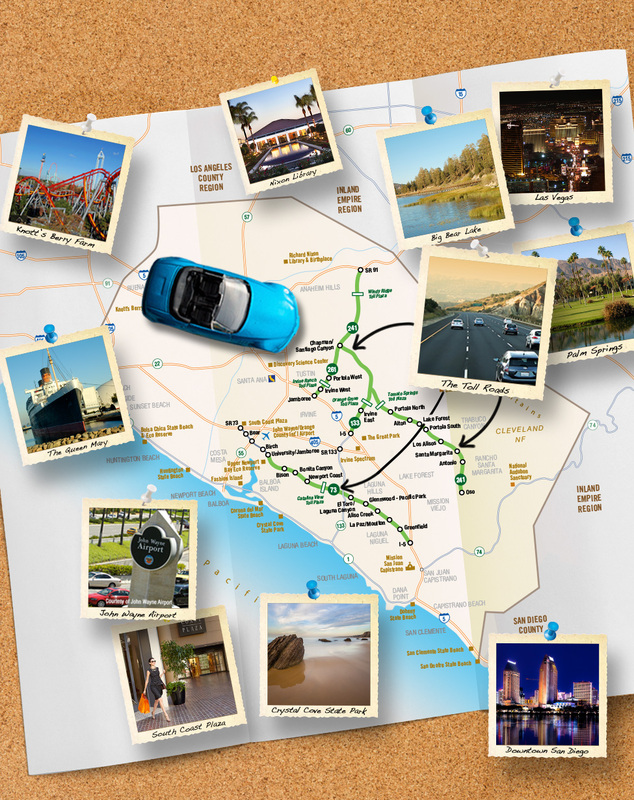 Haven’t experienced a nonstop, stress-free commute in Orange County in a while? Now’s the perfect time to give The Toll Roads a try for an entire week — for free. “We want every motorist in Orange County to experience what 250,000 weekday drivers already know — there’s no stop and go on The Toll Roads when you have FasTrak® or an ExpressAccount™,” said Lisa Telles, The Toll Roads’ chief communications officer. In anticipation of The Toll Roads removing cash toll collection on May 14 at 12:01 a.m., TCA is offering new FasTrak and ExpressAccount customers a free week of nonstop driving as soon as they establish an account at thetollroads.com (PROMO CODE: FREETOLL). The offer ends May 11. In January, The Toll Roads introduced more ways to pay tolls to replace cash toll collection. Along with the hugely-popular FasTrak payment method, the three new ExpressAccount types make the drive on The Toll Roads fast and convenient — and most importantly — nonstop. With FasTrak and ExpressAccount, all tolls are collected electronically while motorists travel at highway speeds. 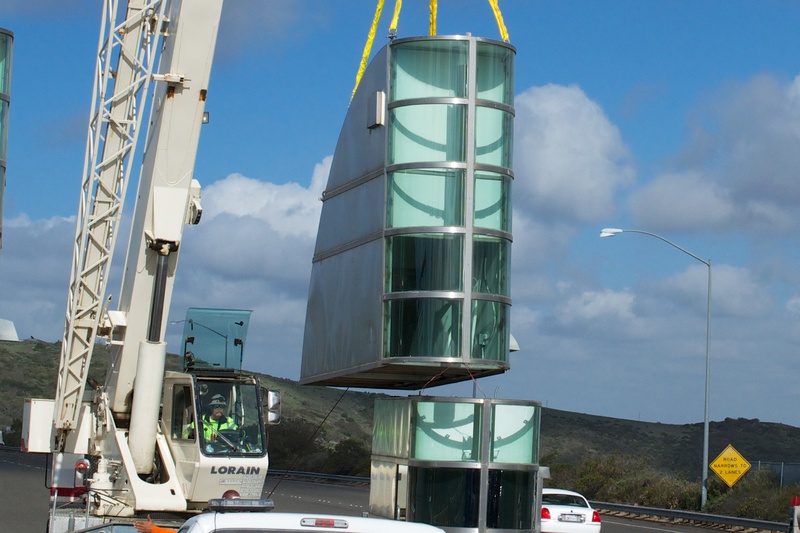 This week, two iconic tolls booths were removed from the 73 Toll Road’s Catalina View Mainline Toll Plaza in preparation for the end of cash toll collection on The Toll Roads (State Routes 73, 133, 241 and 261). 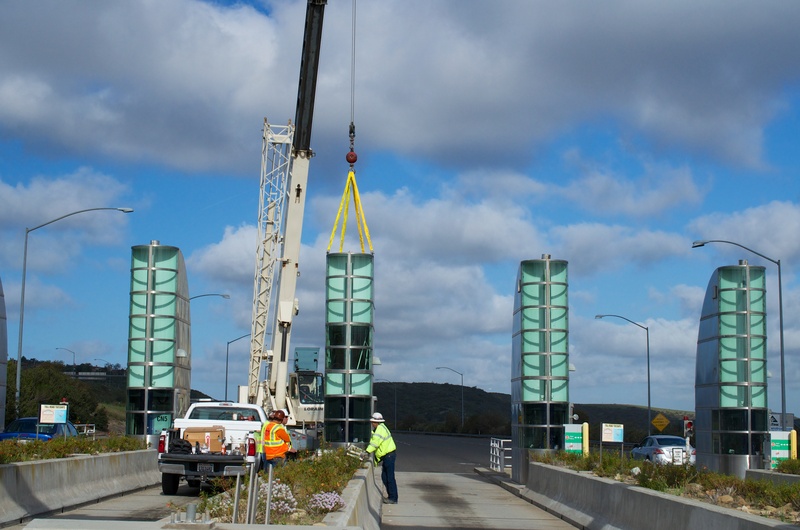 Construction crews used a 40-ton crane with a 94-foot reach to dismantle and remove one toll booth from the southbound 73 Toll Road on Wednesday morning and one toll booth from the northbound 73 Toll Road on Thursday morning. Combined, the toll booths (which measure nearly 19 feet tall, 4 feet wide and 11 feet long) have processed more than 10 million cash transactions since they were opened in 1996. With the removal of a single toll booth in each direction, two current cash payment lanes will be combined into one wider lane that will be used by trucks when cash toll collection ends on The Toll Roads in May. For more information on the removal of cash toll collection from The Toll Roads, click here. In anticipation of the removal of cash toll collection from The Toll Roads in May, last month we introduced four new ways to pay – three ExpressAccount™ types and a One-Time-Toll™ option. 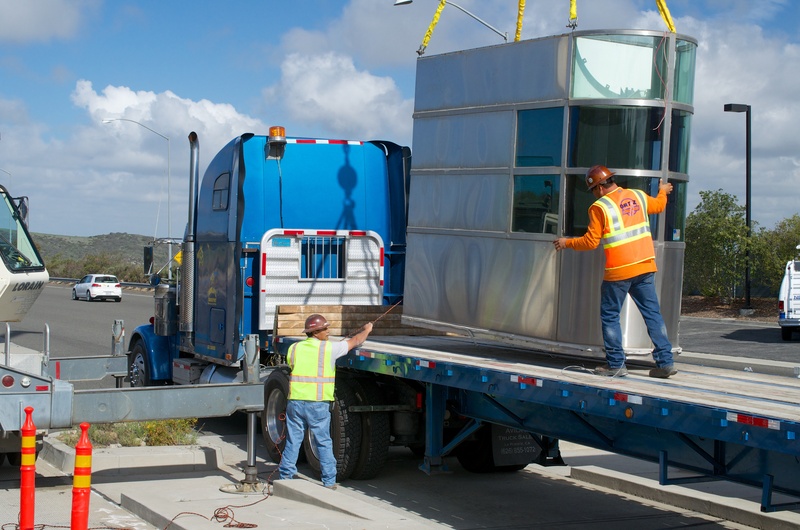 What do these changes mean for FasTrak® Drivers? Nothing. What do FasTrak accountholders need to do now that there are ExpressAccounts? Nothing. Keep your FasTrak transponder affixed to your vehicle’s windshield. Keep driving in the FasTrak lanes. Keep paying the lowest tolls (on average 20 percent less than ExpressAccount and One-Time-Toll tolls). Keep replenishing your prepaid FasTrak account using credit card, cash or check. Keep using your FasTrak transponder to pay tolls electronically on ALL tolled bridges, lanes and roads in California (including the 91 Express Lanes). Keep easily managing your FasTrak account online or with The Toll Roads’ free app. For years roughly 80 percent of our drivers have paid tolls with FasTrak; last month 83 percent used FasTrak. As we move toward removing cash payment on the roadways, less and less drivers are using cash to pay. Last month less than 13 percent paid with cash; six months ago nearly 16 percent used cash. Also last month, we introduced the three new ExpressAccount types and people immediately started signing up for the account type that best fits their needs. FasTrak drivers now share their lanes with ExpressAccount drivers. Lower tolls are deducted from a FasTrak account via a vehicle’s transponder and higher tolls are deducted from an ExpessAccount via an image of the vehicle’s license plate. Do you have a question about FasTrak, ExpressAccounts, One-Time-Toll or The Toll Roads? If so, leave it below as a comment.